Reading the Fantastic Four comics from the start. It’s issue number FOUR hundred! Gimmie a gimmick: This the third of three covers using an iris-in effect, with a rainbow foil surface framed around the characters, getting larger with each issue. In this one, it covers almost the entire space. There was also a separately-sold regular cover. 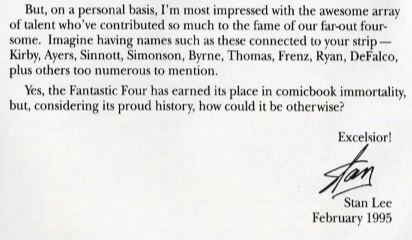 We begin with a one-page text into from Stan Lee, saying pretty much the same things he’s said in every interview about the Fantastic Four, that he and Jack Kirby wanted them to be feel like real people living in the real world, while also having crazy superhero adventures, and how the FF kicked off the entire Marvel Universe. Franklin becomes overwhelmed with psychic energy, saying “he” is near, and Huntara opens a portal. Sue then spots Uatu, Earth’s Watcher, who explains The big Watcher is “the One,” the living repository of all observations of all Watchers. The Celestials decided that the One was declared to be a threat to the “cosmic balance of power.” Further, the Celestials have decided that all the Watchers must die. The FF ask Uatu how to defeat Aron. Uatu doesn’t answer, but gives them a strange device. 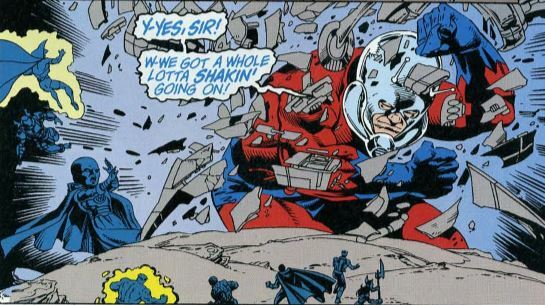 Ant-Man deduces that the device combines with the others the Watchers left behind in previous issues to create a weapon. 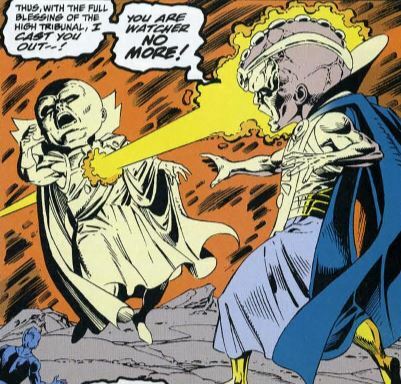 Franklin tries to read Uatu’s mind, and he can see Aron’s plan. Aron is building a secret base in the asteroid field between Jupiter and Mars, where he plans to trap Earth’s solar system in his own pocket universe. The heroes decide to split into two teams. 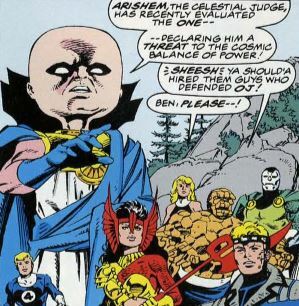 Ben’s team will take on Aron, and Sue’s team will help save Uatu and the other Watchers. Ben, Franklin, Ant-Man, Huntara, Nathaniel, and Vibraxis travel to Aron’s asteroid, where Aron summons classic FF villains from other timelines to fight them. This includes Blastaar, Dragon Man, and the original Frightful Four. As the issue goes on, it keeps cutting back to this fight, as Aron introduces more classic villains in their classic forms, including Namor the Sub-Mariner, the Red Ghost and his Super-Apes, and finally the Mole Man and all the giant monsters from way back in the first issue. Even more past villains join in as the fight continues. While that’s going on, things get cosmic back on the Watchers’ planet with Sue, Johnny, Lyja, Nathaniel, and Devlor. Lyja shares some Skrull knowledge about the Celestials, saying they actually exist in hyperspace, and the giant suits of armor conduits for them to interact with this plane of reality. So the plan is to get inside the armor somehow. 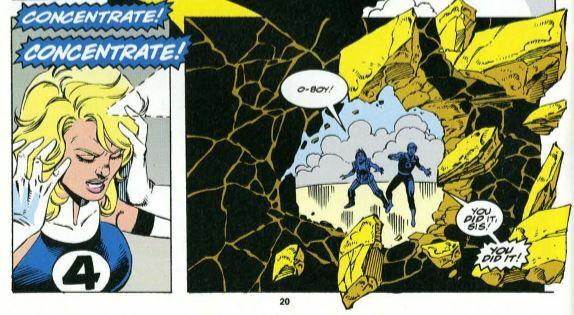 Nathaniel conveniently explains that Sue draws the energy from invisible force fields from another dimension, and this somehow allows her to break through armor with a force field, after much concentration. Inside the Celestial’s body, the heroes fight their way through alien antibodies, the team comes to a strange door. After busting through it, everyone is attacked by more antibodies, and only Sue gets away. Alone, she finds the Celestial’s brain and touches it. Her mind is filled with memories of the fateful spaceship crash that gave the FF their powers. She is then confronted by a perfect replica of herself, who explains a bunch of sci-fi gobbledygook about a big bang and the creation of the multiverse and about how the One is somehow slowing the expansion of the multiverse, so the Celestials are stepping in to prevent this. Or something It’s very confusing. 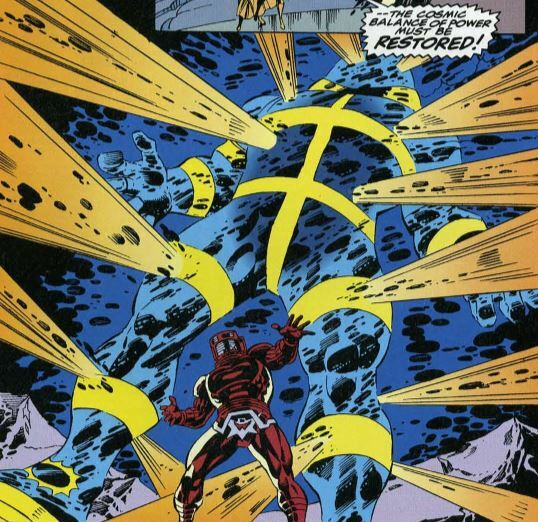 The Celestial succeeds in killing the One, but then Sue uses a force field to destroy the Celestial’s nerve center, declaring “the cosmic balance of power is restored!” Back on the planet’s surface, the Watcher says the One and the Celestial will regenerate in a thousand years, and start this conflict all over again. By that time, the Watcher says he hopes humankind will have evolved to the point where they can step in and save the day themselves. Sue chews the Watcher out for all the times he broke his oath to only watch and instead help out, and she asks him to do it again. On the asteroid, the super-weapon is destroyed, and Ant-Man proves he doesn’t need it by growing to Giant-Man size and destroying Aron’s mechanism that way. 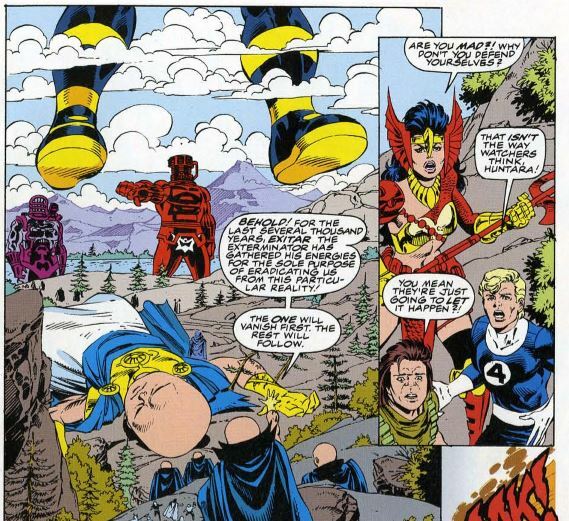 Sue’s team arrives with the Watcher, who attacks Aron. The Watcher says that humans must be allowed to evolve on their own, rather than be trapped in the past. The Watcher transforms Aron into pure energy to be used in the One’s eventual regeneration. It’s still not over. Another Watcher, known only as He-Who-Summons, shows up and says the Watcher has violated his oath too many times, and is condemned, and banished from the Watcher race. He still has cosmic powers, though, and teleports everyone back to their ship. Then there’s a weird bit of business about finding a fourth member of the Fantastic Four. They offer it to Franklin, who doesn’t really answer. Ant-Man says he doesn’t belong. Kristoff volunteers, but is rejected. The reason why none of this makes sense is that in issue #401, we’re going to have a Fantastic Five situation, with both Ant-Man and Kristoff on the team. It ends with Sue ruminating on the Watcher, saying that even though he’s been cut off from his people, he’ll continue trying to make the universe a better place. Then there’s a three-page text piece, where writer Michael Marts argues that Fantastic Four earns the title “world’s greatest comic magazine.” Then there’s a backup story, “In Memoriam” where the FF holds a funeral for Reed, and Sue finally gives in and acknowledges that Reed is dead. A bunch of Marvel heroes show up for the funeral, where there’s another flashback retelling the FF’s origin story. 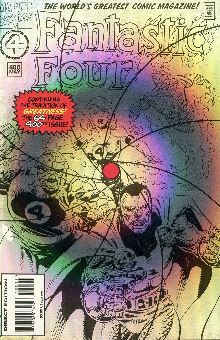 Fade out: This is a big issue for Sue, witnessing the creation of the multiverse, and then changing the course of her own universe. Her accepting Reed’s death is another big character moment. Clobberin’ time: Ben makes a joke about the OJ Simpson trial, in case you were wondering what year this issue came out. Flame on: There’s still more drama between Johnny and Lyja. Johnny can tell that Lyja still has feelings for him, and he tries to resist the thought that maybe they could get back together. Fantastic fifth wheel: Welcome to the team, Kristoff! This issue firmly establishes that Kristoff has come to terms with him not being Dr. Doom, but Doom’s adopted son with all of Doom’s knowledge. And some fans think this character is ridiculous. Ant-Man worries that he’s the weakest member of the FF, only to surprisingly save the day again, except that last-minute saves has pretty much been his shtick since he joined the team. 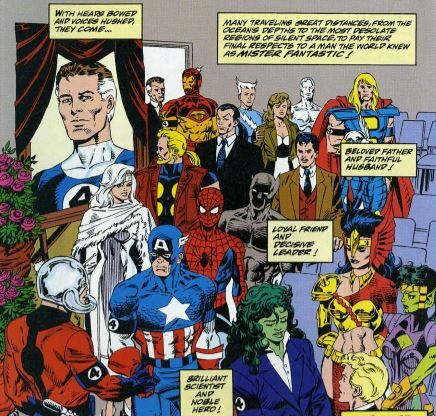 Among the Marvel heroes attending Reed’s funeral, we have former alternate team members Crystal and She-Hulk, as well as future alternate members Spider-Man and Black Panther. Medusa appears in the asteroid fight alongside the original Frightful Four. The Marvel wiki says this version of her was taken from somewhere between Fantastic Four #36 and #38. Four and a half: Franklin gets a lot of praise for his leadership of the Fantastic Force team, but if you’ve been following that series, you know the team is kind of a mess. 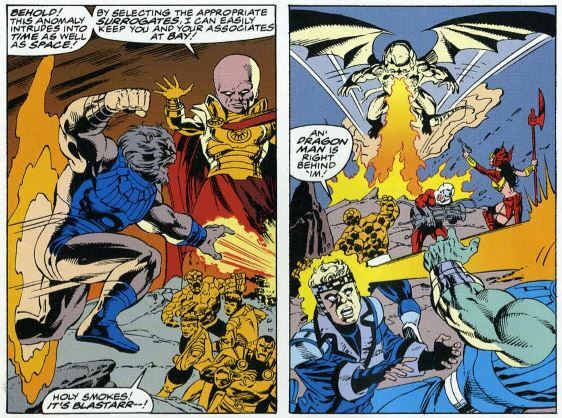 The Alicia problem: Lyja says the Celestials created the Skrulls. This is later confirmed during some Skrull/Celestial action in Silver Surfer #5 and Blackwulf #9. 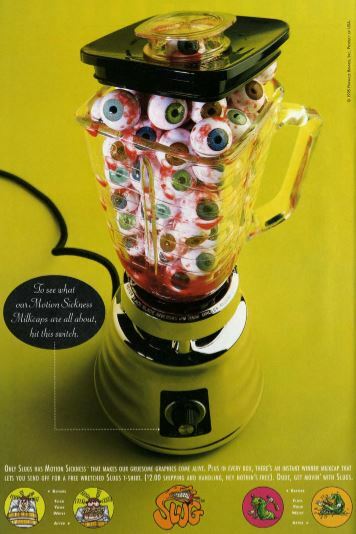 Commercial break: I have no idea what this ad is selling. Trivia time: The Watcher being cut off from his people is never really resolved. His next appearance after this is will be in Uncanny X-Men #355 where he acts like everything’s normal. Later, in She-Hulk #18, we see him working alongside other Watchers as if nothing happened. While the Celestials are normally a bunch of unmoving giants on a distant planet, this issue is one of the rare times that they actually get and do stuff, even acting as individuals. The Celestial in Red is Arishem the Judge, who judges the One, and the blue and yellow one that Sue defeats is Exitar the Exterminator. The other Celestials appearing in this issue are Tefral the Survivor, Nezarr the Calculator, and Ziran the Tester. Fantastic or frightful? I daresay I really enjoyed this one, and I think it’s one of the best of writer Tom DeFalco’s oft-derided time on series. Putting Sue at the center of cosmic Marvel in place of Reed was a great choice, and it shows a lot of growth for her character. All the villain cameos made for some fun nostalgia along the way. Next: …and keep her by the sea.